The Heritage Arabian Racing Club (HARC) is a world-wide organization that supports and promotes racing for those who wish to preserve the purebred Arabian of traditional type and bloodlines and to ensure the long-term future of Arab horse characteristics, in the broadest terms, with the hallmarks of beauty, athletic ability, soundness and versatility. In order to preserve the classic characteristics of the purebred Arabian horse, it has been agreed that a HARC (Heritage Arabian Racing Club) horse is any purebred Arabi- an registered in any WAHO accepted stud book and it must not contain the blood of the following stallions in any generation of its pedigree in order to pursue the goal of diversifying the gene pool of Arabian racehorses. Stallions excluded: Amer, Ba- roud III, Burning Sand, Dragon, St Laurent, Tiwaiq. It is hoped that by providing a support forum for breeders and obtaining sponsorship for HARC member races, not only will it encourage owners and breeders of ‘Heritage’ Arabians to join the grass roots of our sport but also broaden the base of Arabian racing worldwide, and help to preserve valuable bloodlines which can continue the heritage of their ancestors. The USA will host five races offering HARC added-money in 2017. Dates are forthcoming. A minimum of $4,000 in HARC added-money bonuses will be paid out per race to the the top three HARC nominated finishers, split between the owner and breeder of the horse. All racehorses, broodmares and stallions at stud who wish to be eligible for the HARC added-money program must go through a one-time nomination process. Once eligible, the horse remains HARC-eligible for the duration of its life, even through ownership changes. Please follow this procedure when nominating your horse or stallion. Once the form and payment have been received, your nominated horse will be run through the HARC Management Committee. Upon approval, you will be emailed a confirmation of your horse’s acceptance into the HARC program, along with the HARC logo that can be used in conjunction with the horse’s promotional efforts. September 13, 2016 – We are nearing the end of our first year for HARC races and racing forums in the USA. Like any first-year venture, we were excited about getting things going quickly, and as usual with these new initiatives, things do not progress as we quickly as we think they should. For example, two of the five states that we’d hoped could host a race offering the HARC added money were cancelled: Michigan and Delaware. 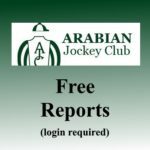 Michigan’s Arabian racing scene is unfortunately struggling with inadequate horse numbers, and was unable to fill a race. Therefore, no HARC added money could be offered. And though Delaware had plenty of races to offer, it didn’t have any HARC-eligible horses running. However, juxtaposed to this picture is Dartyn Kriss SWA, the pure Polish mare who ran in two of the other HARC races, and walked away with $5520 in HARC money this year. She was the only HARC horse to run in the HARC race in Colorado, then shipped to California’s HARC race at Pleasanton in June and picked up another piece of the pie. Certainly, Dartyn Kriss’ owner/breeder, Dr. Jim Wetzel, was just fine knowing he was taking home the majority of the earnings! Then, take Robert Irlando, owner of the HARC-nominated Zells Bells (SW Zell x Bonita Lorena, by Wiking), who demonstrated that HARC horses can be competitive at all levels after Zells Bells dueled valiantly with the Burning Sand colt, Raineing Sand, only to lose by a nose… but also beating two other Burning Sand progeny in the race by over 7 lengths! Irlando walked away not only with his share of the purse, but also with a HARC check for $1240 as the owner. Jane Teutsch received $1240 from HARC as the breeder. For the rest of the story, click here. Do you believe in the mission of HARC? Want to become an Associate Member? Download the HARC Associate Membership Form!